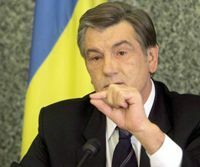 If the coalition does not confirm its existence de facto, President of Ukraine Victor Yushchenko will look for other political ways of overcoming the negatives processes in the parliament. According to an UNIAN correspondent, press secretary of the President Iryna Vannikova said this at the press conference for mass media today. According to her words, V. Yushchenko positively apprehends the start of the negotiations and notes that he supports the coordinated action plan of the leaders of the coalition, which will be realistic and will base on clear arrangements. According to the head of the state, I. Vannikova said, the recipe of “recovering” of the democratic majority is simple and well-known – returning to the fulfilling of the constitutional agreement. In this way the existing of this coalition will have the sense for Ukraine. V. Yushchenko is sure that the parliamentary majority has to demonstrate to society its effectiveness, first of all, with the effective voting in the session hall, said I. Vannikova. According to her words, the Presidents thinks that adoption of laws, particularly, fixed in the coalition agreement, adopting the amendments for the state budget will become persuasive confirmation of activity of the current coalition.